Myanmar Government Accused of Backsliding Over Proposed Changes to Assembly Law - Integration Through Media ....! 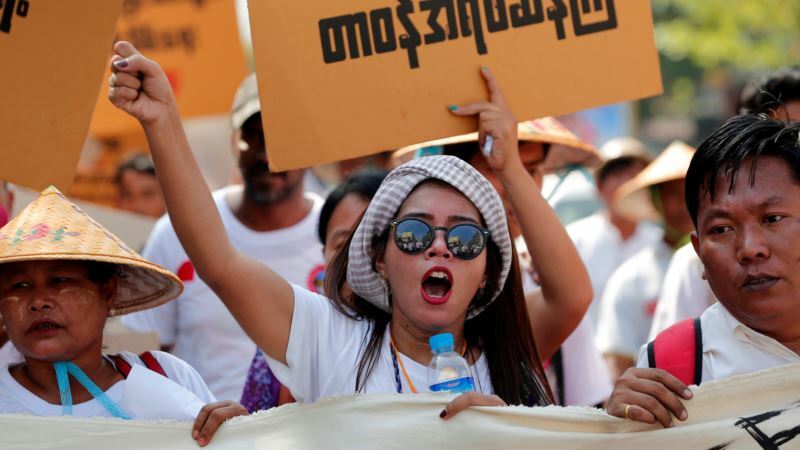 (VOA): Proposals put forward by Myanmar’s government to add further restrictions to a controversial assembly law have attracted widespread criticism, with rights groups accusing the civilian-led government of backsliding on democratic progress. The proposed amendments come after a series of protests in the country, including one against a deadly government crackdown in Mrauk U, Rakhine State, in the west, and the killing of rebel soldiers from Kayah State, in the east. Nationalist groups have also become increasingly vocal in recent months, particularly in the aftermath of the crisis in Rakhine State, for which Myanmar’s government and its military have attracted considerable international criticism. The proposed amendments have been met with a significant backlash from several quarters. On March 5, hundreds of protesters marched through downtown Yangon against the proposed changes, holding placards and chanting slogans that accused the government of attacking freedom of expression. Thet Swe Win told VOA that the changes were a retreat from democratic progress in the country. “This proposal is so they can arrest whoever they want. This is improper and undemocratic,” he said. Despite the country being ruled by Aung San Suu Kyi’s National League for Democracy (NLD), which many hoped would bring an era of political reform to the country, those protesting against the changes have found an unlikely ally in the form of military-appointed lawmakers, who have spoken out against the proposed amendments. Several senior officials from the NLD refused to comment when contacted by VOA to discuss the issue, and it is unclear what the reasons are behind the proposed changes, which have attracted criticism from both inside and outside the country. Lawmakers from elsewhere in the nation have also criticized the proposed move, saying they represent a backsliding of democratic progress. “If passed, the amendments would not only stifle freedom of expression and peaceful assembly, but would also mark a significant shrinking of democratic space in Myanmar,” said Teddy Baguilat, a Philippines congressman, who is also a board member of the ASEAN Parliamentarians for Human Rights. “Many are ambiguously defined and significantly widen opportunities for the authorities to further criminalize peaceful protests under a law that had already been used numerous times against students, farmers, and journalists,” said Baguilat. Additional reporting from Aung Naing Soe in Yangon.